Got a paint brush so hard that you can drive nails with it? 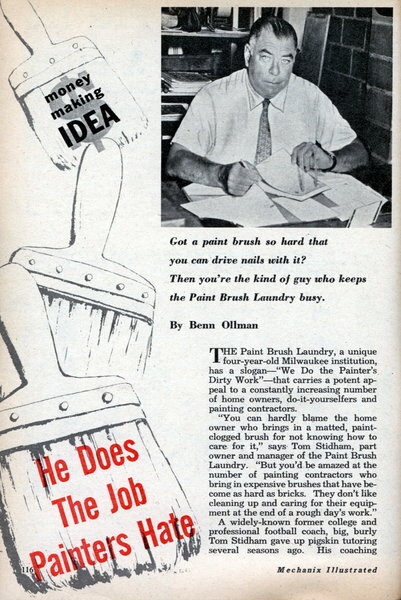 Then you're the kind of guy who keeps the Paint Brush Laundry busy. 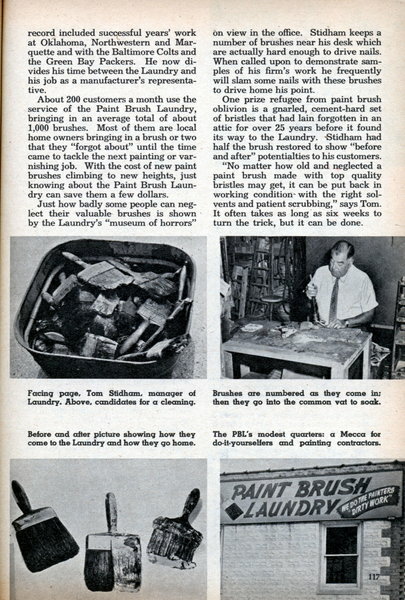 By Benn Ollman THE Paint Brush Laundry, a unique four-year-old Milwaukee institution, has a slogan—"We Do the Painter's. Dirty Work"—that carries a potent appeal to a constantly increasing number of home owners, do-it-yourselfers and painting contractors. LOOK, MA, no hands! 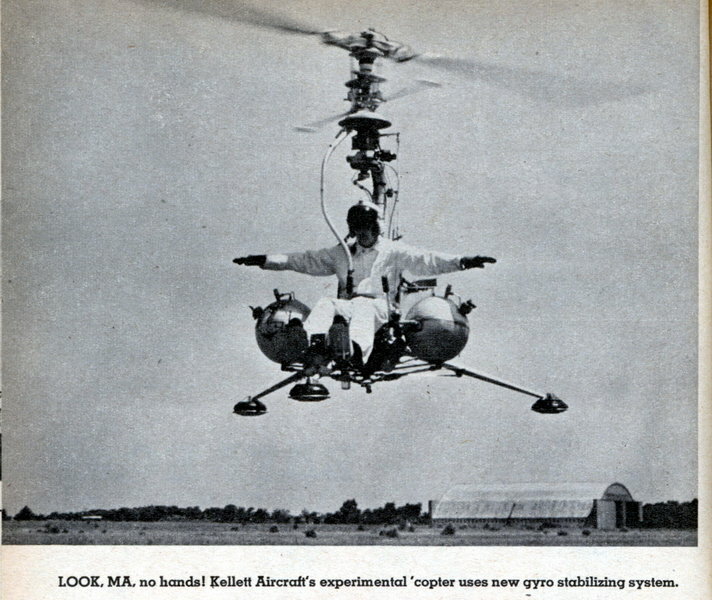 Kellett Aircraft’s experimental ‘copter uses new gyro stabilizing system. 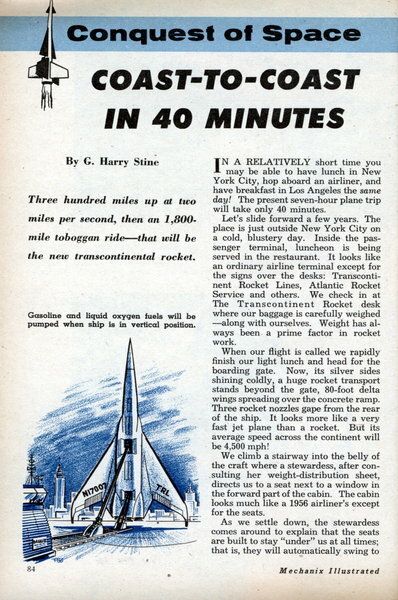 By G. Harry Stine Three hundred miles up at two miles per second, then an 1,800-mile toboggan rideâ€”that will he the new transcontinental rocket. IN A RELATIVELY short time you may be able to have lunch in New York City, hop aboard an airliner, and have breakfast in Los Angeles the same day! The present seven-hour plane trip will take only 40 minutes. Let's slide forward a few years. The place is just outside New York City on a cold, blustery day. Inside the passenger terminal, luncheon is being served in the restaurant. 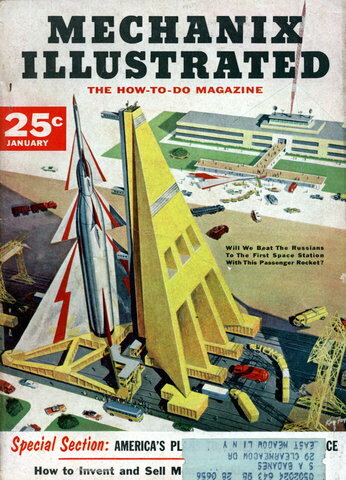 It looks like an ordinary airline terminal except for the signs over the desks: Transcontinent Rocket Lines, Atlantic Rocket Service and others. 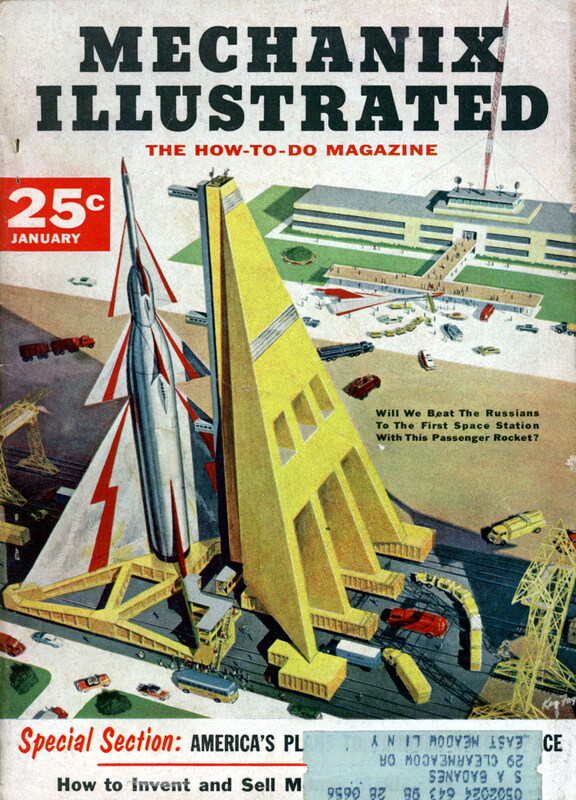 We check in at The Transcontinent Rocket desk where our baggage is carefully weighed â€”along with ourselves. 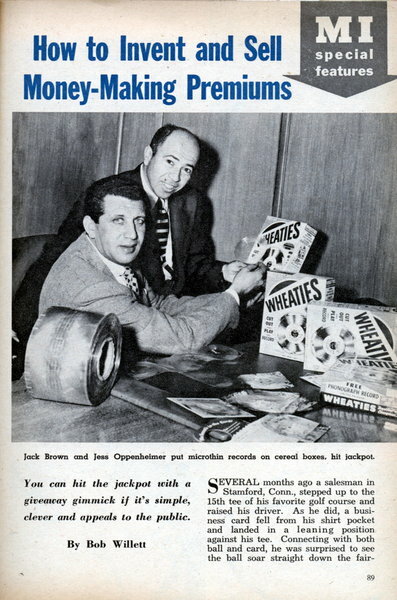 Weight has always been a prime factor in rocket work. 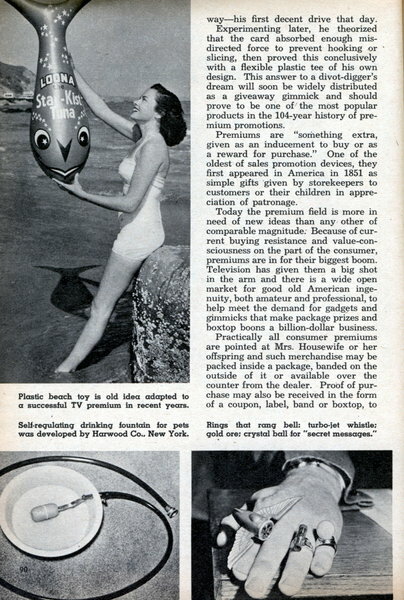 You can hit the jackpot with a giveaway gimmick if it's simple, clever and appeals to the public. By Bob Willett SEVERAL months ago a salesman in Stamford, Conn., stepped up to the 15th tee of his favorite golf course and raised his driver. As he did, a business card fell from his shirt pocket and landed in a leaning position against his tee. Connecting with both ball and card, he was surprised to see the ball soar straight down the fairwayâ€”his first decent drive that day. Experimenting later, he theorized that the card absorbed enough misdirected force to prevent hooking or Â¦ slicing, then proved this conclusively with a flexible plastic tee of his own design. This answer to a divot-digger's dream will soon be widely distributed as a giveaway gimmick and should prove to be one of the most popular products in the 104-year history of premium promotions. Designed for travel from earth satellite to the far reaches off outer space, this amazing "solar butterfly" uses an electrical jet exhaust. By Frank Tinsley PRESIDENT EISENHOWER'S recent announcement of a federally-sponsored earth satellite project tears aside the curtain of secrecy that has long veiled our space travel research. 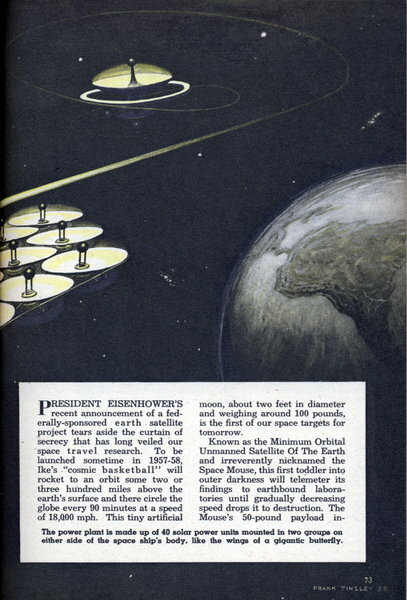 To be launched sometime in 1957-58, Ike's "cosmic basketball" will rocket to an orbit some two or three hundred miles above the earth's surface and there circle the globe every 90 minutes at a speed of 18,000 mph. This tiny artificial moon, about two feet in diameter and weighing around 100 pounds, is the first of our space targets for tomorrow. 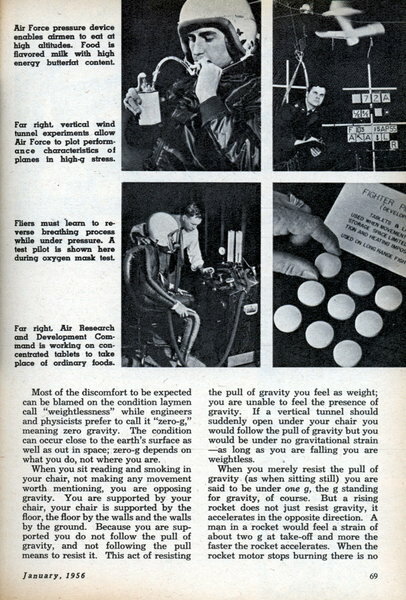 Eating, washing and sleeping will be tough problems for passengers on the first flights to outer space. 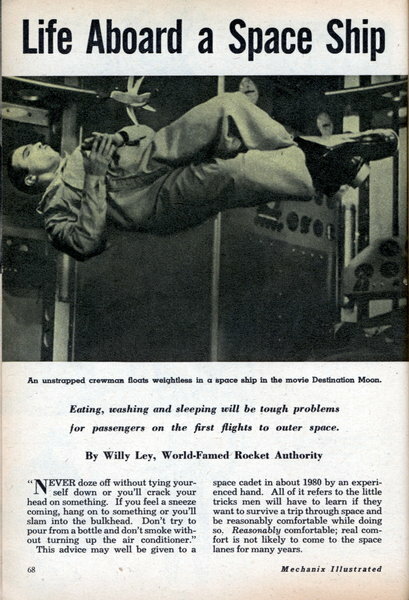 By Willy Ley, World-Famed Rocket Authority NEVER doze off without tying yourself down or you'll crack your head on something. If you feel a sneeze coming, hang on to something or you'll slam into the bulkhead. Don't try to pour from a bottle and don't smoke without turning up the air conditioner." This advice may well be given to a space cadet in about 1980 by an experienced hand. All of it refers to the little tricks men will have to learn if they want to survive a trip through space and be reasonably comfortable while doing so. 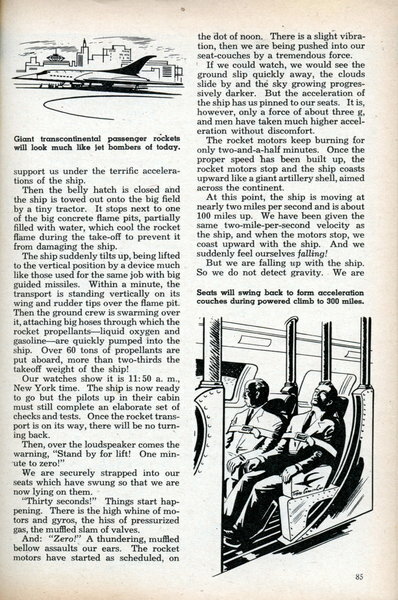 Reasonably comfortable; real comfort is not likely to come to the space lanes for many years. 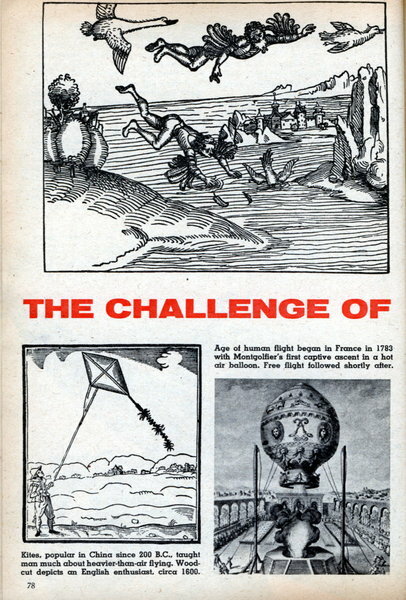 The Challenge of Space The dream of human flight is as old as manâ€”and the ultimate goal is the stars. 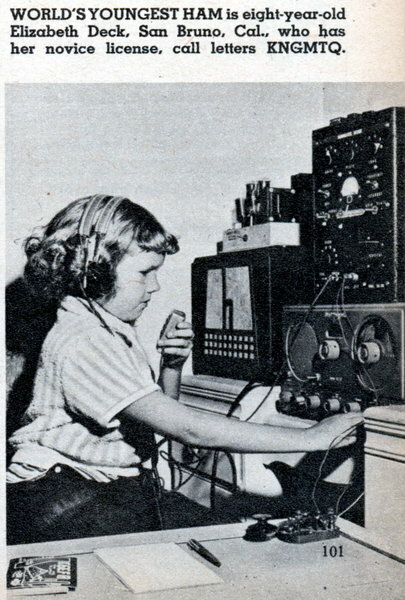 WORLDS YOUNGEST HAM is eight-year-old Elizabeth Deck, San Bruno, Cal., who has her novice license, call letters ENGMTQ. THREE-WAY SPURS. 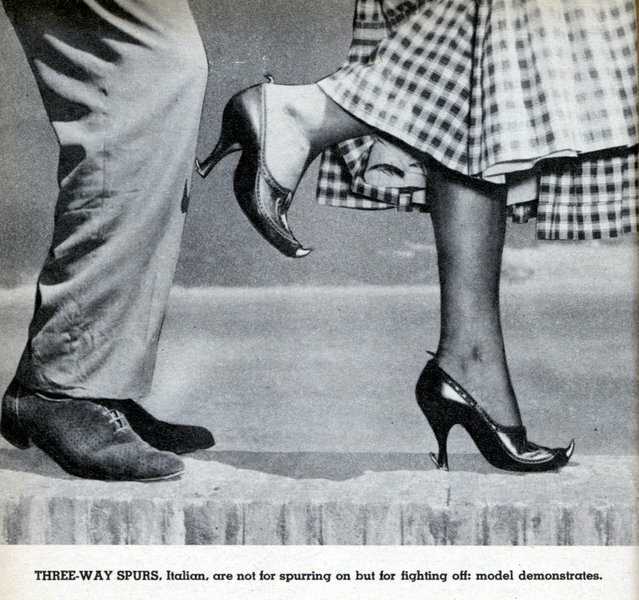 Italian, are not for spurring on but for fighting off: model demonstrates. 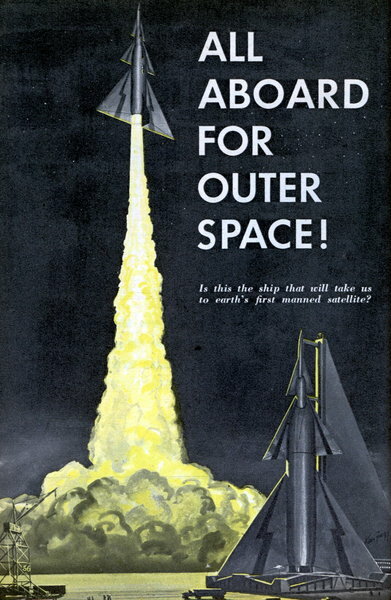 ALL ABOARD FOR OUTER SPACE! Is this the ship that will take us to earth's first manned satellite? 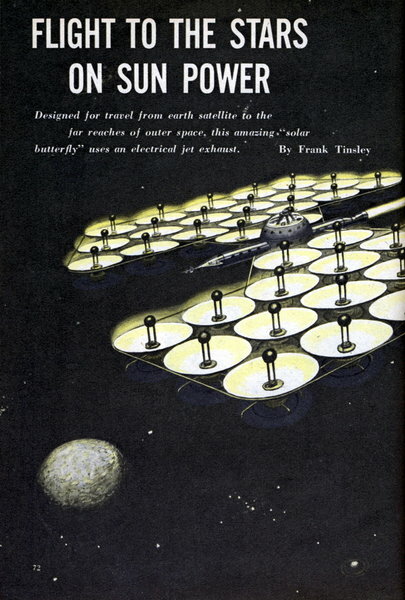 By G. Harry Stine, Viking-Aerobee Operations Engineer, White Sands Proving Grounds ON May 24, 1954, a Navy Viking rocket thundered 158 miles into space. As recently as February 1949, a V-2/ WAC-Corporal "Bumper" rocket soared 250 miles into the sky over New Mexico's White Sands Proving Grounds. Just last year, an Air Force pilot flew the Bell X-1A rocket plane "above 80,000 feet" and at more than twice the speed of sound. 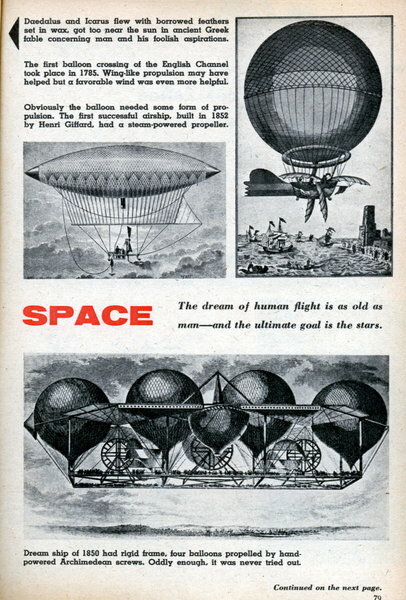 We have built rockets which have gone beyond the earth's atmosphere and returned; they have reached altitudes where the remnants of the atmosphere around them were a better vacuum than that in a radio tube. 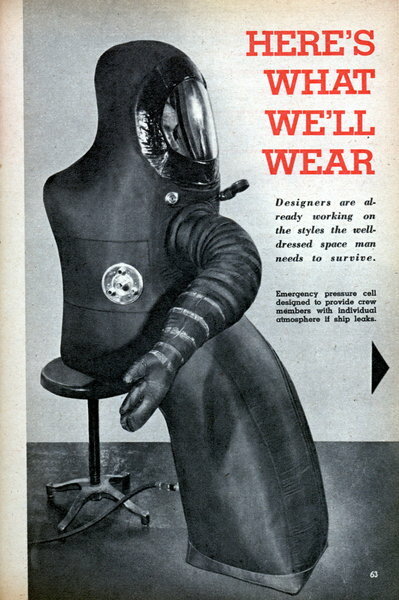 We have sent men to altitudes where their blood would boil if they were not protected by a pressure suit and a pressurized cabin.